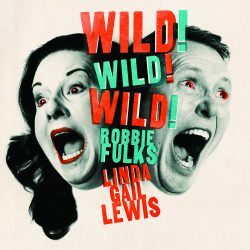 ‘Wild Wild Wild’ is the debut collaboration between Grammy nominated and long-time Bloodshot Records artist Robbie Fulks and Memphis rock-n-roll royalty Linda Gail Lewis, the little sister and frequently performing partner of Jerry Lee. This great ball of fire was recorded in Chicago with Alex Hall (JD McPherson, Cactus Blossoms, Pokey LaFarge) and features musical contributions from a who’s-who of American roots music legends, stalwarts, and peers including Redd Volkaert (Merle Haggard), Danny B. Harvey, Scott Ligon and Casey McDonough (NRBQ, The Flat Five), Kelly Hogan (Mavis Staples, Neko Case), Joan Collaso, Yvonne Gage and others. The energy on this record is unreal. The honky-tonk opening of ‘Round Too Long’ hits you like a train with LG Lewis’s autobiographical tales grabbing and shaking you to the core. Robbie Fulks (who produced here) takes the lead vocal for ‘I Just Lived A Country Song’ with passionate musing of excesses summarised beautifully with “I can’t recall the early 90’s.” The title track ‘Wild Wild Wild’ sees Fulks and Lewis sharing vocals with simply fantastic old school no nonsense rock’n’roll. You get a chance to breathe on the Django Reinhart influenced ‘Who Cares’ which is an absolute delight with some spellbinding gypsy jazz guitar work. If Margo Price’s stories of revenge are your bag you will love ‘Till Death’ where Lewis tells of her graphic intention to kill her cheating lover. More gypsy jazz for ‘Memphis Never Falls From Style’ where homage and thanks are paid to this wonderful city. ‘Boogie Woogie Country Gal’ does exactly what is says on the tin and sees Lewis tearing it up. Lewis’s vocals are faultless throughout this wonderful musical journey. It’s fair to say every track is a Killer (!). I absolutely loved this record. I’m pretty sure you will too. Near perfect debut collaboration by Fulks and Memphis rock ‘n’ roll royalty Gail Lewis.